The CosmoStat group is based in the astrophysics division (IRFU/DAp-AIM) of CEA Saclay, which is around 23 km South of Paris at Orme des Merisiers and around 1 km South of the main CEA campus. You can reach the DAp via a combination of commuter train (RER) and local bus. Take the RER B towards Saint Rémy les Chevreuses until the stop Le Guichet. (Note that not all trains stop at Le Guichet, as indicated by the lights on the panel at every station.) From Le Guichet take bus number 9 to Orme des Merisiers. 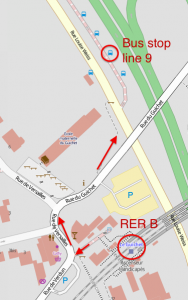 To reach the bus stop, exit the RER station at exit #2, rue de Versailles. Pass by the café La Terasse, cross the road towards the day-care and go down a little path (there are signs "Gare routière") until you reach another road. The public bus stand is on the opposite side of the road from where the coach leaves. The line 9 goes every 15-20 minutes and takes about 10 minutes to reach Orme des Merisiers. Alternatively, take the RER B towards Saint Rémy les Chevreuses and get off at Massy-Palaiseau. From there take bus number 91.06 or 91.10 (Make sure the bus goes "via Polytechnique"). One bus of any of those lines leaves every 5-10 minutes and take 20 minutes to reach Orme des Merisiers. 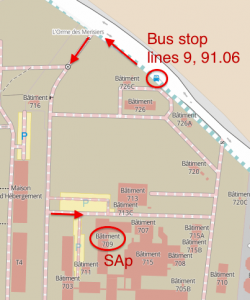 After you exit the bus at the stop Orme des Merisiers, keep walking along the direction of the bus, and take the first road to the left to enter the campus. Go straight through the roundabout, and take the second road to your left (after ~ 50m). The DAp is the reddish building across parking lot, building number 709 (see map). Paris has two airports, Orly [ORY] and Charles-de-Gaulle [CDG]. From both airports, you can easily reach Saclay by public transport. From Orly it's about 1h, from CDG 1h30. By train you will most likely arrive at one of the train stations in central Paris. From there you can take the metro to get to the RER B which takes you towards Saclay. Go to vianavigo.fr to find how to reach the nearest RER B station. See this page for hotels near Saclay. 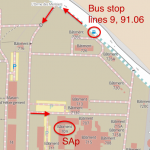 It is advisable to get accommodation along the RER B line (e.g. Gif-sur-Yvette, Orsay, Massy), or in Paris on the South bank (most convenient is 14th arrondissement). Please reload this page if the map is not visible.